The AstroTurf did a number on Mike Ivanow. Two operations on his elbows. Bad knees from diving to stop shots and landing hard on the unforgiving artificial surfaces of the Kingdome and Memorial Stadium. Ivanow could be bitter and angry about his surgeries and pains, but he isn’t. Neither are the other fellows who banded together to make up the original Sounders. Everyday guys from these parts and the West Coast and seasoned veterans from the British Isles played here in the 1970s and early 1980s to create soccer magic in Seattle. Soccer fans look back on the North American Soccer League days here with such fondness that the flame flickered but never died even when the team and league folded. And three decades later, it was rekindled with the arrival of Sounders FC of Major League Soccer and its rabid fan base. 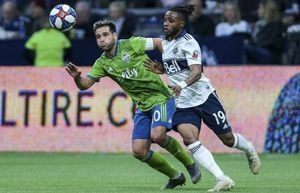 Players and coaches who were here for the exhilarating rise — and eventual fall — of the original Sounders share the fans’ affections. From Alan Hinton to Jimmy Gabriel, from Tommy Jenkins to Jeff Stock, their voices take on almost reverential tones when they recall the days when pro soccer took its first steps in the Emerald City. And born out of the NASL’s failure were soccer nuts who now bring their children to Qwest Field to see the Rave Green. 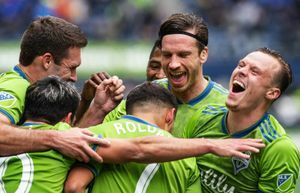 Those blokes with the funny accents and the fresh-faced kids who started it all set the stage for the stunning success that Sounders FC is having. “It was fantastic playing in Seattle,” said Ivanow, who came from the San Francisco Bay Area to join the Sounders. “The Kingdome was an unbelievable atmosphere. In the playoff game against the L.A. Aztecs [in August 1977], I’ll never forget coming out of the tunnel and the whole stadium was rocking from the rafters. Something different was how the team embraced its fans. The Lads, as they were nicknamed, interacted with fans like no other team in the city. They made regular appearances at camps and schools. They signed autographs after games and enjoyed a libation or two at local pubs, win or lose, with the public and even opposing players. Such actions endeared them to the local community, which came out in droves to cheer them on. Gary Wright, now an executive with Sounders FC, was the Seahawks’ director of publicity in the late 1970s. Busy as he was with the fledgling NFL team, he noticed something special with the Sounders. The love affair between a bunch of blokes and teenagers and a city began in 1974. Jimmy Gabriel arrived that year as a player, a 33-year-old Scotsman already capped twice by his national team and having spent seven years with Everton, one of the best-known teams in the English Premier League. Gabriel was immediately named team captain, and when the team’s inaugural season opened at Memorial Stadium, 12,000 fans instead of the expected 2,000 showed up. The decision to come to the U.S. was the right one for Gabriel. Things kept getting better for Gabriel. The Sounders made the playoffs in his second and third seasons, and in his fourth, he was named player-coach. Gabriel would eventually leave Seattle to return to England and coach after being replaced by Alan Hinton in 1980. But he came back and settled in the area for good. Now he is 68 and has 11 grandchildren. Others from Europe came and stayed. One was Tommy Jenkins, a midfielder from England who played with Gabriel there. Jenkins remembers playing in front of more than 58,000 fans at the first sporting event at the Kingdome, a 1976 NASL exhibition game against the New York Cosmos and the great Pelé. Jenkins, the first Sounder bought with a transfer fee rather than being loaned out, liked Seattle right away because the rain reminded him a lot of England. He discovered an organization that wanted to establish a connection with the community and keep foreign players in town year-round, rather than allow them to return to play in their homelands at season’s end. It was clear from the start that soccer could and would work here. It might have continued to flourish had not the franchise folded after the 1983 season. Yet for those 10 seasons, Howe and the Sounders had the time of their lives. “It was the place to be,” Howe recalled of Sounders games. Hinton had the financial backing of Sounders ownership to find and sign players, and brought with him a couple of countrymen, Roger Davies and David Nish. In his first year, Hinton led the Sounders to 25 wins, the most in team history. In his last season, 1982, Seattle played in the Soccer Bowl for the NASL title, losing to the hated Cosmos. Hinton, like so many other former Sounders, stayed in the area. He coached the Tacoma Stars of indoor soccer. The Europeans weren’t the only ones getting in on the fun. Young local American players like Brian Schmetzer, Jeff Stock and Chance Fry, who’d grown up going to Sounders games, were fresh out of area high schools in the late 1970s and early 1980s. Suddenly, they found themselves playing with international veterans. Schmetzer, who would go on to span decades in the local pro soccer scene as coach and player, graduated from Nathan Hale right into the NASL. He remembers often being picked to appear at youth clinics with his younger teammates because the veterans would pull rank. Fry was drafted after graduating from Sammamish High School in Bellevue. Stock came to the team out of Stadium High School in Tacoma and enjoyed most the rivalries with Vancouver and Portland in the NASL. Jimmy McAlister was one of the first locals to join the Sounders. League rules forced teams to have two North Americans on the field at all times, hence the team scouted the best local and regional talent. 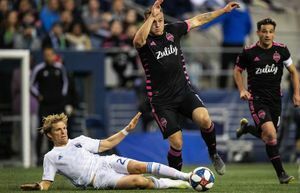 McAlister, from Burien’s Kennedy High School, was a left back who idolized former Sounder Dave Gillett, then spent four seasons playing with him. Like his teammates, he wasn’t in the game for the money. Nowadays, people who were kids in the glory days see McAlister, and remember when he visited their schools. On Sept. 19 when Sounders FC hosts Chivas USA, the team will honor the NASL Sounders. For NASL fans like Sounders FC general manager Adrian Hanauer, doing so was an easy decision.